Cobbled streets, ancient buildings and a selection of quaint shops and tearooms make up the small town of Rye. Once nearly completely surrounded by sea, Rye used to be a major port town. Today, it is a popular tourist destination and its rich history can be explored in Rye Castle, which was built in 1249 and now serves as a museum. Rye became a popular location for fishing and smuggling. The town’s Mermaid Inn, which was frequented by the town’s smugglers, is popular with tourists and is believed to be haunted. This picturesque building, along with Rye’s secret passageways and cobbled streets, has made the town a popular choice for the setting of many novels and films. The town has also been home to many notable people, including children’s author Joan Aiken and actor Tom Baker. Rye’s fascinating history, ancient buildings and picturesque setting make it the perfect location for a special event. For an event that is held in a historical setting such as Rye, there is no better way to celebrate than with some hearty, traditional British food. If you wish to make your event truly special, then a hog roast is the perfect option. Taste the Cracklin is the perfect way to make any event even more enjoyable. A hog roast is not only affordable but also versatile. You can enjoy it at any type of event, whether it’s a small family gathering, a corporate event, a festival, or a wedding. It will provide you and your guests with a great food in a great location. We are the perfect solution for those that want to create the perfect event. Hiring a hog roast machine will enable you to be provided with an affordable catering option that will leave your guests impressed. You can be a hog roast spit chef for the day and not only give your guests great food but also provide them with entertainment. When you opt for a hog roast, you are provided with so much more than just the meat. You can select a menu that will be suitable for whatever type of event you are planning. If you wish to hold a buffet event, then you can have pork sandwiches with apple sauce and delicious crackling or if you are planning something a little more special, then you can opt for a gourmet hog roast dinner with delicious accompaniments such as stuffing, potatoes or salad. Your hog roast does not just have to be limited to pork. You can enjoy a variety of other succulent meats such as lamb, chicken, beef and Turkey. This enables you to select a menu that will suit your type of event. If you wish to have all the work done for you, then you can choose to have your hog roast cooked and carved for you. You can choose from a selection of menus for your event and sit back and relax with your guests as you enjoy the mouth-watering aroma and flavours of the hog roast. Your hog roast will be set up a few hours before your event so that there is plenty of time to prepare before your guests arrive. Taste the Cracklin is the perfect way to celebrate a special event in a special location. With its interesting history and picturesque buildings, Rye is the perfect location to enjoy a banquet type event or a wedding. A hog roast is the perfect option for those wishing to celebrate the town’s history whilst taking in the sights. Hog roast hire Rye is ideal for those wishing to enjoy the experience of hog roasting. 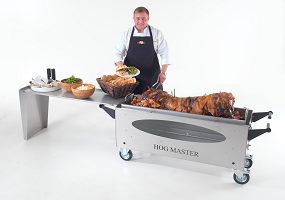 Whether you wish to hire out a machine for a barbecue event or you are a company in need of something special for an event day, hog roast hire is the perfect solution. A hog roast not only provides great food and entertainment but will also make winter events much more warm and inviting for your guests. The enticing aroma of a hog roast and its versatility have made it a popular choice of catering for events. A hog roast can provide the perfect comfort food for an outdoor event or something more extravagant for a special event such as a wedding. A hog roast can truly make any event, whether formal or informal, much more memorable. Whatever type of event you are planning in Rye, a hog roast will help to complete your special day and will enable you and your guests to enjoy a hearty meal in a stunning location.